Every High Holiday season a powerful sound momentarily causes we who experience it to pause. Tekiah. Shvarim. Truah. Tekiah Gedolah. Those sounds, stirring and dramatic, lead to personal reflection about how we missed the mark in the previous year and how we want to improve in the coming year. But shofar is about more than the individual. Its raw blasts provide an opportunity to experience Jewish Peoplehood in a visceral way. One reason is that hearing the shofar is one of the most accessible of all Jewish rituals. It requires no special training or extensive prior knowledge. All Jews, no matter our backgrounds, can participate, as we have for millennia. Deaf Jewish communities too; like this one in Northridge, California; have made accommodations for the shofar ritual, giving members a means to feel the shofar’s vibrations by holding onto fluttering balloons, onto the bimah, or even onto the shofar itself. The shofar is also a ritual expression of Rav Soloveitchik’s teaching about shared Jewish fate and destiny, which is summarized in this video from the toolkit about the theme of Collective Belonging. Shofar is one of the oldest rituals in Judaism, going all the way back to Mount Sinai, that quintessential historical moment all Jews share, part of our fate. Shofar is also about the future. The Truah blast—nine short, punctuated sounds—is like an alarm clock, waking us up to make the world a better place, calling us to our shared destiny as Jews. This High Holiday season, as I begin my work with the Center for Jewish Peoplehood Education, I plan to pay extra attention to the shofar blasts, really taking the time to pause and take stock of my distinctive role to play in our Jewish collective. The shofar ritual gives us all that opportunity. Daniel Olson is a PhD student in Education and Jewish Studies at NYU and a Wexner Graduate Fellow. His work at NYU focuses on better understanding the curricular and educational goals of programs for Jews with developmental disabilities. He began working this year as a New York Educator for the Center for Jewish Peoplehood Education. 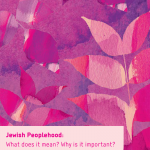 PreviousPrevious post:Resources for the High Holiday SeasonNextNext post:Themes of Jewish Peoplehood – now on video!